From May until November 1961, more than 400 black and white Americans risked their lives – many enduring savage beatings and even imprisonment – for simply traveling together on buses and trains through the deep south. Documenting the story of the Freedom Rides and the courageous civil rights activists that traveled together is award-winning filmmaker Stanley Nelson. 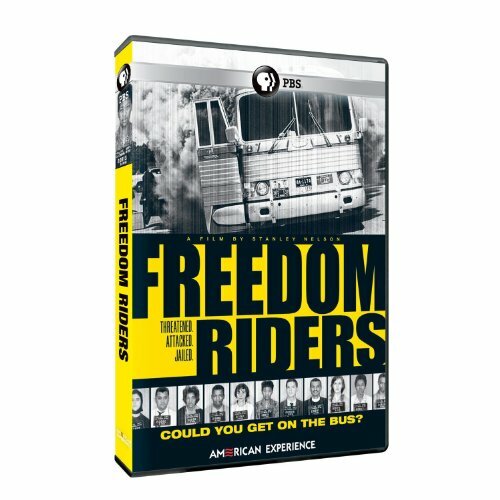 Arlington, Va. – April 12, 2011 – This May, PBS Distribution and AMERICAN EXPERIENCE, television's most-watched history series, will release Freedom Riders on DVD and Blu-ray – 50 years after the original Freedom Rides took place. From May until November 1961, more than 400 black and white Americans risked their lives – many enduring savage beatings and even imprisonment – for simply traveling together on buses and trains through the deep south. Documenting the story of the Freedom Rides and the courageous civil rights activists that traveled together is award-winning filmmaker Stanley Nelson ("The Murder of Emmett Till," "Jonestown"), who wrote, produced and directed Freedom Riders . This moving documentary will be available on DVD and Blu-ray May 17, 2011, day and date with the program's broadcast on PBS, for $24.99 and $29.99. Featuring interviews with Julian Bond, John Lewis, C.T. Vivian, Harris Wofford, Evan Thomas and others, Freedom Riders is the powerful and inspirational story of the men and women who, using non-violent tactics, risked their lives to challenge segregated facilities in the south in 1961. The film features testimony from a fascinating cast of central characters – the riders themselves, state and federal government officials, and journalists who witnessed the rides firsthand. The film is partially based on Raymond Arsenault's acclaimed book "Freedom Riders: 1961 and the Struggle for Racial Justice." American Experience is hosting the 2011 Student Freedom Ride, a journey retracing the historic civil rights bus rides that changed America. Accompanied by some of the original Freedom Riders, forty college students will participate in the bus ride which will take place from May 6 - 16, 2011. Television's most-watched history series, AMERICAN EXPERIENCE has been hailed as "peerless" (Wall Street Journal), "the most consistently enriching program on television" (Chicago Tribune), and "a beacon of intelligence and purpose" (Houston Chronicle). On air and online, the series brings to life the incredible characters and epic stories that have shaped America's past and present. Acclaimed by viewers and critics alike, AMERICAN EXPERIENCE documentaries have been honored with every major broadcast award, including fourteen George Foster Peabody Awards, four duPont-Columbia Awards, and twenty-seven Primetime and Creative Arts Emmy Awards, one most recently in Outstanding Directing Nonfiction for My Lai. PBS Distribution is the leading media distributor for the public television community, both domestically and internationally. Jointly owned by PBS (Arlington, VA) and WGBH (Boston, MA), PBS Distribution extends the reach of public television programs beyond broadcast while generating revenue for the public television system and our production partners. PBS Distribution offers a diverse range of programming to our customers, including Ken Burns's films (The National Parks, The War, Baseball, Jazz, The Civil War), documentaries from award-winning series NOVA (The Elegant Universe, Origins, The Miracle of Life), FRONTLINE (Bush's War, Growing Up Online), and American Experience (We Shall Remain, Jonestown, New York), dramas from Masterpiece (Jane Eyre, The Inspector Lynley Mysteries), films from independent producers (Latin Music USA, The Botany of Desire, The Story of India, Journey into Buddhism, I.O.U.S.A. ), and popular children's programming from Dinosaur Train, Super Why!, WordGirl, Cyberchase, Martha Speaks, Caillou and Arthur.